A healthy spine has a few twists. Physiological bend in the thoracic region is called kyphosis. The most common abnormal kyphosis is a deformity of the spine. kyphosis Treatment depends on the cause of deformation. A healthy spine has physiological bendingthoracic, called - kyphosis. 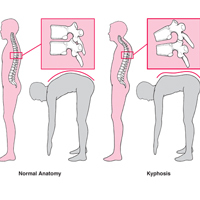 Normally bending is 20 ° C-45 ° C. However, the term kyphosis often used to refer to abnormal strain of the thoracic spine - increased kyphosis or hyperkyphosis. Postural kyphosis or nestrukturalny mostfrequent type of kyphosis, characterized hunched, improper posture and rather moving the spine, with increased natural curve. At the request of the patient upright - kyphosis decreases. Usually it manifests itself in adolescence, often in girls. Postural kyphosis rarely accompanied by pain,exercises to strengthen abdominal muscles and Hamstring stretching (hamstrings) help to reduce the discomfort associated with kyphosis. With age, this type of kyphosis usually does not bring additional health problems. Radiographically vertebrae changes are observed. Scheuermann's kyphosis - structurally similarpostural kyphosis, Scheuermann's kyphosis usually appears in adolescents (boys are affected twice as often as girls) especially in lean children. deformation angle sharper and more pronounced when viewed from the side, while bending forward. Deformation mainly affects the thoracic spinespine, although rarely is also evident in the lumbar spine. 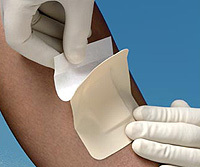 Pain localized to the top of the deformation, which increases with activity, as well as the long standing or sitting. When X-ray examination is observed change in the shape of the vertebrae - a characteristic wedge bodies and narrowed intervertebral prostanstva. Often accompanied by scoliosis of the spine - kyphoscoliosis. Congenital kyphosis seen in the newborn, inwhere the spine during fetal development began to develop with disabilities, for example sroschёnnye together several vertebrae or vertebral hypoplasia (polupozvonok). In most cases, surgery is required in early childhood that allows you to keep a physiological shape of the spine. However, continuous monitoring is required for any changes in the process of growth of the organism. It should be further examination by magnetic resonance to make sure that no deformation compresses the spinal cord. Osteoporotic kyphosis appears with age, when there are sedimentation compression fractures of vertebral osteoporotic. Kyphosis may develop as a result of injury,abnormalities of the vertebrae, degenerative diseases. Scheuermann kyphosis is unknown reason. Other causes of kyphosis - tuberculosis, neurofibromatosis, muscular dystrophy, tumors, disc degeneration and other. Treatment of kyphosis depends on the cause of deformation. Postural kyphosis improving over time, physiotherapy helps to reduce the discomfort or pain associated with the wrong posture. When Scheuermann kyphosis conservative treatment includes a special program of exercises and anti-inflammatory drugs for pain. If the growth is not finished and there is the risk of progression of deformation, appointed corset, which uses the patient until the final maturity of the skeleton. Osteoporotic kyphosis require specific medical treatment in order to prevent subsequent fractures. Surgical treatment is recommended ifabnormal kyphosis value greater than 60 ° for the correction and stabilization of the spine bending. In osteoporotic kyphosis surgical treatment is required, if any neurological symptoms or severe pain. When congenital kyphosis removed pathological vertebrae to release the spinal cord from compression deformation and correct.